As the mushers and snow machiner’s crossed into Nome, some three weeks after the beginning of an epic journey that started in Alaska on a cold, wind-swept afternoon in Nenana, the home base support staff of this expedition sprang into action. At about 6:30 PM my friend Paul–who flew to Nome to see his wife finish the expedition and give her a welcomed hug– texted me and said the dogs were loaded up and on their way. The flight should be in Anchorage no later than 8:45-9:00 PM. Our handler, Austin and I, were already in Anchorage grabbing a bite to eat with our list of people picking up the dogs at the airport firmly in hand–and no sooner than we sat down the calls started to come in. It looked like we were the logistical point of contact. At 11:00 pm or so one of the employees came out and announced: “They’re here! Come pick up your doggies!” and all of us scurried inside. Being the first time I have done this, I was very impressed by the operation. At the meeting with all the mushers in Nenana before they left all of the teams were given a colored coded roll of flagging tape. We had black-red, red-white, pink-black, etc. They started bringing the dogs in on the forklifts in big containers that look like dog boxes we use on our trucks. All of the doors had the tape firmly attached trough the holes, some with little noses sticking out. As the forklift drivers zoomed around bringing in dog box after dog box and the 150 to 300 pound sleds for each musher, the handlers sprang into action after each load was weighed and recorded. All told the cargo weighed more than 10,000 pounds. Within minutes we had engulfed the parking lot with dogs too and fro. 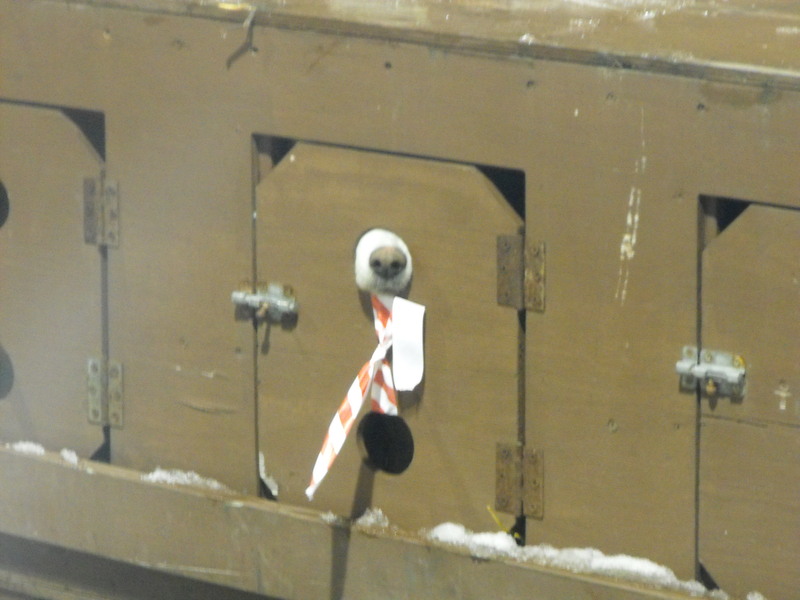 The handlers were taking the pups from the boxes to their trucks. Many of them giving the dogs a light snack and some much needed water. I was surprised at how smoothly everything was going as it neared 1:00 AM. As most of the teams were loaded up and the sleds were secured on the tops of trucks and trailers, we were suddenly missing one dog. One of Margret Black’s Siberians could not be found. We searched high and low in all of the boxes and asked all of the handlers if they had an extra dog. Frantic calls were made to Nome and it was assured all the dogs were on the plane. All of us live pretty close and we are a tight knit group, so we figured that the Siberian Husky would show up at someone’s kennel when they got home. All of the dogs did have the corresponding color tape for each team on their collars as well. Some of the handlers didn’t know all of the dogs they were picking up personally so they may have had an extra dog without knowing it. As I searched the dog boxes around the parking lot and as everyone was leaving, Austin was latching down three of the boxes to a trailer that the forklift guys had loaded up about 20 minutes earlier. I heard a whimper and just assumed it was our dogs that we had just loaded into our truck. Then I heard it again. The missing dog had been found! We hurriedly un-did the straps and “rescued” him/her. Just like a Siberian! Always the ones to get into trouble! We loaded him up into the dog box, with his handler-person Scott and headed North to Willow. We arrived at the dog yard at 3:00 AM and it looked like Scott and his truck arrived shortly before us at the neighbors next door. I am sure we woke up every one within 2 miles with 30 or 40 dogs returning to their dog houses and the excited greetings from their “friends” that had stayed home. But hey, this is Willow, the dog sledding capital of the world. Almost all of our neighbors are dog mushers and those few that aren’t–We’ll be done in a little while…. After getting all the dogs back to the familiar sights, sounds, and smells of their dog houses we began our feeding routine. Austin and I decided it would be best to feed all of the dogs now instead of heading to bed ourselves just to wake up in a couple hours to do it in the morning. Besides, I am sure the Serum Run dogs were hungry. They had just came off a three week adventure on the trail for goodness sake. All of the dogs looked remarkably well. They were happy to see us and gave us all “hugs.” I could also tell that the one of the puppy’s on the team had become a sled dog on this trip. Jewel came back from this 700 mile quest and I hardly recognized her. It looked like she had been pumping iron at the gym. Her legs looked like they were twice the size as when she left, striated with muscles and super strong. The mushers and snow machiner’s should start arriving back home Wednesday and in for a much needed rest before they head back to their “real” jobs and their chores in the dog yard. The dogs–they are ready to pull again, and again, and again. That’s what they love to do. As I laid my head on the pillow at 4:00 AM I was thankful to be a part of all of this and as I dozed off I thanked all of the handlers and support guys and gals that helped last night. I know they couldn’t hear me, but they know they are a part of the team too.